Mercy and truth meet together, intimately connecting close, weaving together peace and righteousness which produces a direction for us to walk in. It is a place of grace. It is a place of hope. It is a place where failure doesn’t seem to fit. Although failure is a large part of our life experiences, I’d like to think that the repetition allowed me to learn how to fail gracefully, but it didn’t. Failure and grace didn’t always seem to be a part of the same equation for me. We each seem to process failure in a different way; our emotional triggers are uniquely individual when it comes to how lack of success affects us. Likewise, we probably all have areas that we tend to react rather than respond…those things that are close to your heart, where you invest yourself. I can tell you that my failure rate feels paramount in those places where my sensitivity is high. When my role as wife and mother are on display, and I bomb, it can be devastating, because they are such personal pieces of my identity. When what ‘should be’ and what ‘actually happens’ collide and implode…it is easy to fall into the cycle of regret. It is hard to see grace in those places. After years of learning to release and repent and let go…and finally starting to understand the freedom we have in this sanctifying power of His saving grace, I can say that regret is not something that I think the Lord calls us to dwell in. In fact, He urges us to come and lay down the burdens and sorrows. He reminds us to dwell deep in the goodness of His love and His grace. He rebuilds us through the redeeming work that was completed on the Cross… where mercy and truth met and kissed and consumed the broken to cure and heal and restore. I didn’t always understand the beauty of letting grace fill up my failures and lead me through repentance into the redemptive compassion of God’s mercy when we fall. Charles Dickens, in his eloquence, captures the feeling so well by pointing out the negativity of regret and failure. All too often, the well that I found myself wading in was one of my own making. Unrealized hopes, unrealistic expectations, unreal goals which often materialized into some sort of self-produced failure that if I could have, should have, or would have done whatever… perhaps wouldn’t have happened. But when a truth teller spoke clear into the depth of my heart, reminding me of the pride of my self-inflicting accusatory living that seemed to invade the words I spoke more regularly than I should, I realized how unfaithful I was acting. Faithlessness and guilt became a common ailment when I let failure rob me of grace in my less than lovely moments. And I sometimes wondered if God was for me in those low places. Even though I knew different. Even though I knew, that I knew, that I knew what the Word of God said about His faithfulness and compassion and trustworthiness and love and mercy and hope. Because HE CAN take what the devil intends for bad, even our biggest mistakes, and turn them for our good and His glory. The times when I found myself letting failure win were the days when I was walking in my own grace… my own abilities. I wanted a different outcome, I wanted a different answer to my predicament, and I wanted to navigate the result because I thought I knew what was best. Sometimes my words get before His grace and it is not pretty. Sometimes I respond without thinking and I act before I put on Jesus. 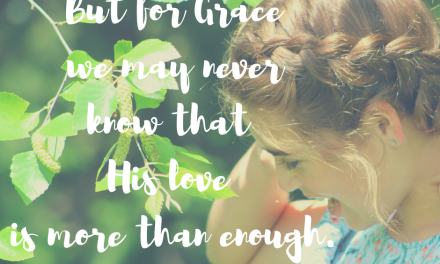 The reality is that I am not enough for the kids God has given me to love and raise and to train and to teach, or my husband as a very imperfect wife, or family and friends as a fallible human being. Yet, when I am not enough there is a chance to see how He is exactly what is needed. They see Him in my failure because grace leads us to the throne of God to obtain mercy when we need it. 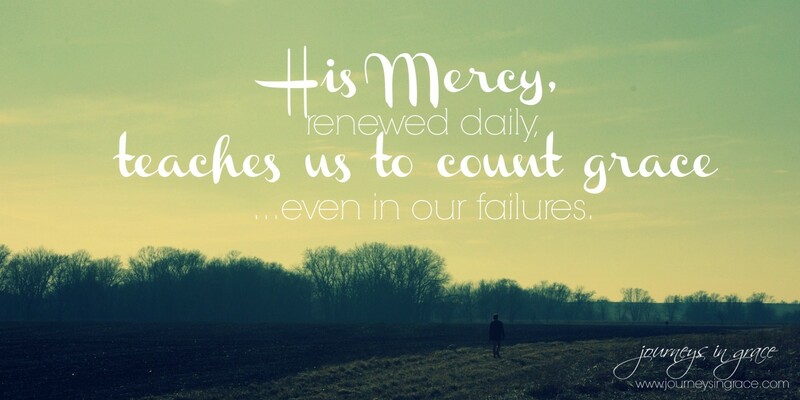 (Heb 4:16) His Grace meets us in our lack and in our failures and it covers the loss with hope.It is the mercy that stems from compassion that which consumes our lives when we let it. Grace is the faithfulness of God that meets us and spills over into our mistakes and our regrets and paints them bright red because He doesn’t expect perfection. He is completing us… we have no need to look back over the missed steps with pain of regret when we have the road ahead paved by grace of repentance. Falling is something we can expect because we are imperfect. In fact, the more I learn about His grace, the more I see that our failures are also a piece of His mercies in our lives. It is chance to experience hope in a different dimension, a powerful place of exchanging perspective with the Father… of nailing the broken to the Cross and taking on the form of the redeemed instead of the hopeless. The more I fall into His grace when I fail, the faster I learn to get up. The more I realize the power of repenting and letting go when I miss the mark, the easier it is choose the Way of Grace. The more I experience the power of His restoring love, the sooner I give in to counting grace in all things. Too many times when we fail or we falter or we just don’t get it right, we allow ourselves to be beaten and bruised by an enemy whose tactic is to steal, kill and destroy. He finds any advantage he can hold over us and our mistakes to keep us stuck in a war that we were never asked to fight. It isn’t the fact that we fall… we are going to do that. It isn’t the reality that we sin… we are prone to depravity. It isn’t that we have missed the mark… we are still a work in progress. Failure only holds us down if never choose to get up again and keep going… And that is where we can see the grace of failure. When failure no longer becomes a stigma of loss of hope and future goals, it instead becomes the foundational lesson which can rebuild our broken moments into grace moments. I am learning to see how he builds us when we fall. He sets us strong on the foundation of grace shadowed by the Cross. I can see where He is teaching us to echo praise and count graces in the hard lessons and difficult times. When failure knocks on our door, we can rest secure in His faithfulness, because He patiently waits for us to let him build us up on the cornerstone of hope mixed with the mortar of faith and the stability of mercy. Where have you been able to count grace moments in failure? Each Wednesday evening I will share a post for the Grace Moments link up with a prompt for you to write about. Every Thursday there will be a linky here at Journeys in Grace for you to share your stories with me, to sit across the virtual Table of Grace here at Journeys in Grace and participate in community of friends that encourage, equip, love and pray for one another. Each week I will try visit as many of your amazing posts as I can and share some of my favorites on my FB page. This is a safe place to sit and dwell in grace together, friends. I can’t wait to pour a cup of friendship with you and take in the grace moments you have to share. Please share the grace moments which have encouraged you in the comments section, I love to hear from you. Link up your inspirational and encouraging post below, or share your blog post inspired by last week’s writing prompt. Invite friends to join in by posting the Grace Moments badge on your post. Copy and paste the permalink to your post. Using the linky tool, enter your link. Find someone (or two) in the link-up to encourage with a comment. 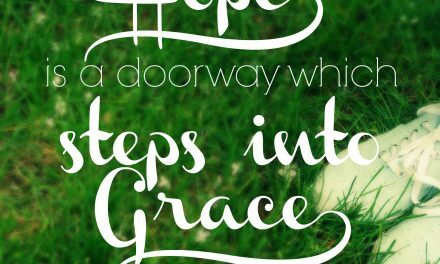 When Emptied Grace leads to Gratefulness…. I loved this Dawn. So practical. And you’re sooo right- it isn’t about the failure but whether or not we choose to get up from the fall! Thanks for hosting the link-up! 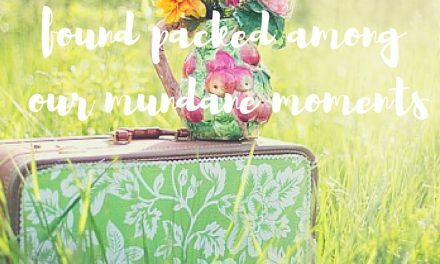 Dawn, I’m new to your blog and I’m so thankful God led me here. What a beautiful work you have! Micah7:8 is dear to my heart! Reading it took me straight to Jesus and His amazing faithfulness. Thank you for that and for your encouragement! “When failure no longer becomes a stigma of loss of hope and future goals, it instead becomes the foundational lesson which can rebuild our broken moments into grace moments.” Amen! Big blessings to you! This here is a powerful thought I will be dwelling on for a bit this afternoon >> “Failure only holds us down if never choose to get up again and keep going.” And in Christ, we are raised up. Beautiful, Dawn. Thank you!